Designed by Videotec, the new ULISSE COMPACT THERMAL offers an integrated solution for high security applications even in total darkness, fog, rain and heavy smoke. The unit combines an advanced thermal imaging module and a Day/Night zoom camera, factory-aligned and installed within the same enclosure. The two cameras deliver high quality images regardless of lighting conditions. The ULISSE COMPACT THERMAL features two independent video outputs and allows dual real-time vision on monitors for an optimal monitoring of the area. These cameras, together with the accuracy and speed of the powerful p&t mechanism, offer a plug and play thermal imaging solution. The thermal camera is an Uncooled Vanadium Oxide microbolometer (VOx) and delivers 320x256 thermal video with an image frequency at 8.3fps or 25fps and sensitivity of 50mK. It supports 2x or 4x digital zoom. A choice of different lenses is offered, depending on the detection distance required. The ULISSE COMPACT THERMAL comes with wiper that cleans both viewing windows. Fast and smooth in motion at 200° per second, the ULISSE COMPACT THERMAL offers 360° continuous rotation, positioning precision and simplified system configuration. This solution is particularly suited for round-the-clock video surveillance in a wide range of high security environments such as perimeter protection, airports, coastlines, prisons and ports. 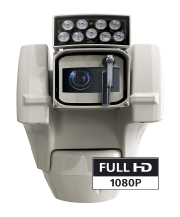 The outdoor ULISSE COMPACT HD PTZ now with exceptional 30x Full HD camera.